Leukemia Fighter! (CML); I Am Dancing and Traveling My Way Through: Are There Angels Among Us? So, as the phone continues to ring, I debate whether or not to answer. Eventually, I succumb and pick up the receiver; warily saying "Hello?" 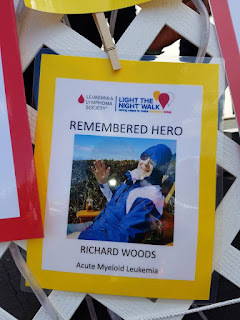 On the other end of the phone I hear an introduction, "Hi, my name is Kelly and I am calling on behalf of the Leukemia, Lymphoma Society and wonder if I could have a few moments of your time." This, of course, allows me to put down my guard and to actually listen to what Kelly has to say. The reason for her call was to ask my opinion on ways that our Boise Chapter of the LLS, could improve on our local Light the Night Walk. After speaking with her for awhile, I realized that I had met Kelly, last year on our walk. It was Kelly's first walk and her father has just passed from Acute Myloid Leukemia. I remember her being totally overwhelmed and emotional, and I remember feeling so sad to have met someone, who so recently had lost someone they loved, to blood cancer. And I remember being so impressed that she was there! 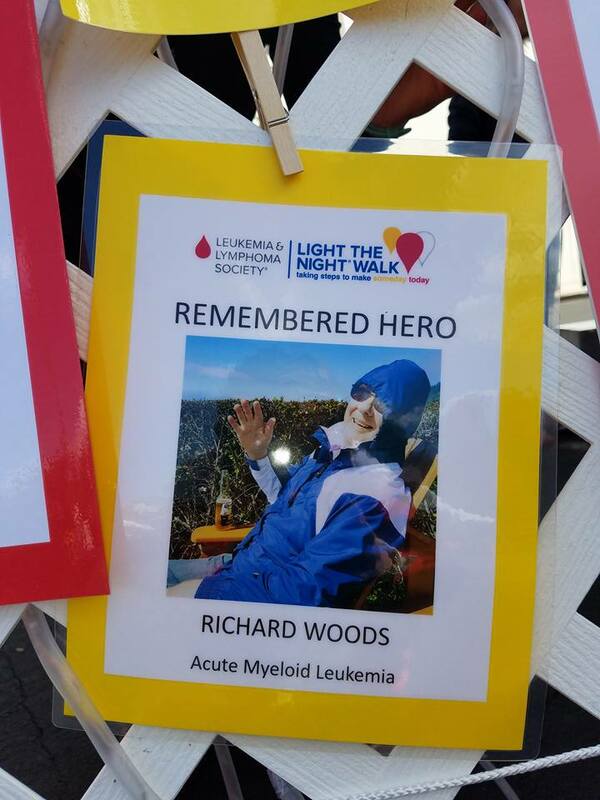 Light the Night is an uplifting fundraiser for blood cancers, but it is also a very sobering experience; while there are always success stories, there are also many losses. At any rate, as we continued to chat, the subject wound its' way around to the wonderful LLS staff that we have here, in Boise, and all of the work that they have done in getting Survivor/Fighter shirts made for those of us still in treatment, fighting our disease. She then mentioned that she had just read something online about that and I told her that it was possible that what she had read, was on my blog. There was silence on the other end of the phone, and then she said "Wait! What is the name of your blog?" I told her and she said "Oh, my God! I have been looking for you!" Which leads me to the next part of this story. 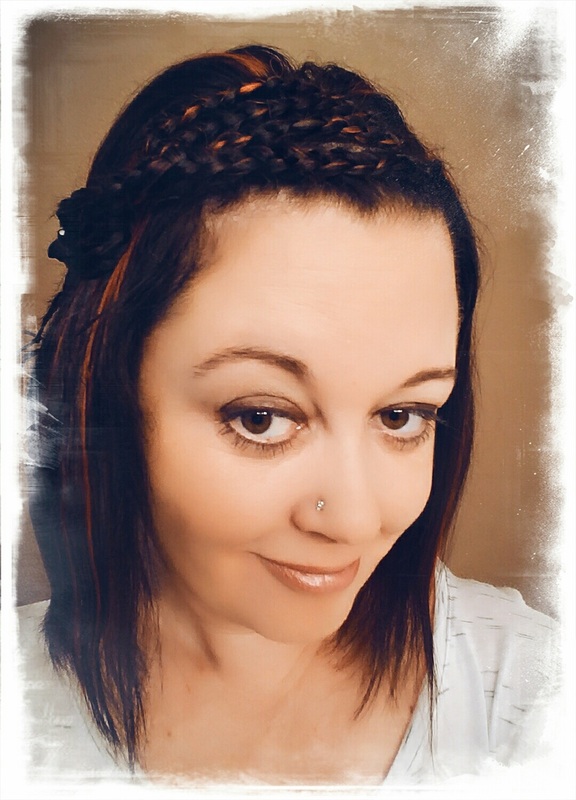 Kelly is currently fulfilling a promise that she made to her father; she is working in a hospital and volunteering and raising money for the LLS. She vows to pick up the fight against cancer, where her father left off, and to fight in his honor. Two days before my dad lost his courageous battle; I looked straight into his sunken eyes and with wobbling cheeks, vowed that I would now take over. 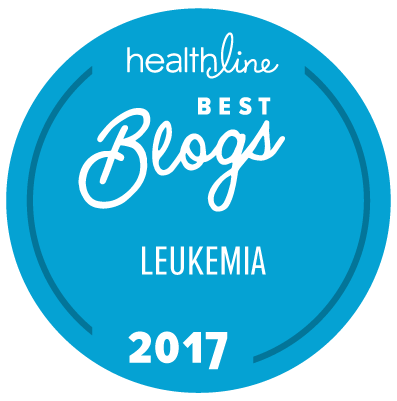 Kelly has kept her promise to her father and is continuing to work in the very place she took her Dad for treatments, and she continues to volunteer her time to the LLS. For the truly remarkable part of this story, I want to share with you an absolutely amazing, and very touching story that Kellly experienced and shared on her social media outlet page. These are her words and her experience and I asked permission to share them with the world; I pray that you are as inspirited, encouraged and fascinated as I am. "Please bear with me even though I need to wipe tears from my eyes and gunk from my nose as I tell you a tale, which even I cannot comprehend. It was a usual day at work, with wheelchairs zooming by, patients sitting in the lobby awaiting procedures, Linda's loud, humorous laughter; roaring from afar, fire alarms going off, doctors rushing by in their white collared coats and many hearts of strangers. The end of the day had approached when a man arrived at my desk inquiring about where he could pay his bill. "Sure, I can show you. Follow me this way," I advised him. We walked the short distance to see Jennie; however, when we arrived I noticed she was already speaking with another patient. "Well it appears she is assisting another patient at the moment. If you'd like, feel free to have a seat on her couch and I'll let her know you're waiting," I kindly told him. I walked back to my desk and sent Jennie an instant message informing her someone was waiting in her lobby. I then began focusing on an overdue work assignment. About 45 minutes passed and the lobby was dead, when I heard someone interject with ahem. I unglued my eyes from the computer screen to see the gentleman whom I had helped earlier. He leaned in toward me inconspicuously and what happened next; I suppose you will need to be the judge of that. "I want you to know that you are a beautiful person, with a beautiful smile and a beautiful soul. 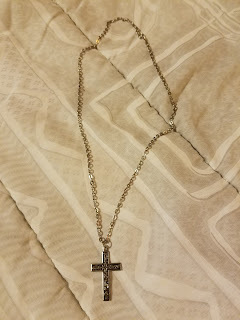 This is for you," he spoke, as he handed me a beautiful necklace." He then said something which nearly shocked me to death. "Your father is proud of you,” he muttered. My eyes welled up as I struggled to thank him while choking over my tears. A meltdown had begun to emerge. He turned and slowly began to walk away. I attempted to hide my face in the process of hurrying to the back to 'lose it', but stopped for a couple of seconds to turn to take one final glance at him, but he had vanished. Where could he have gone in a matter of a few seconds, as he was heading in the same direction that he had originally entered through, which is a bit of a walk? I am uncertain at this point for a probable cause, but I will add that through this experience, I have finally discovered my thesis for my final exam essay, "Might divine intervention truly exist?" I am sure that you will agree that this is a sign that Kelly is not only honoring her father, but she is honoring each and every one of us that is either fighting our battle with cancer, or know someone that is fighting or has lost their battle to this disease. Thank you Kelly for sharing your time, your heart and your story. The gentlman in your story is correct, "Your father is proud of you.” And I am proud to call you "friend." Thank you, Kelly; you are our Angel! Kelly, you ARE special, and do not let outside influences make you feel otherwise. You have gone through a difficult period and it seems that you are still right there....allow yourself time to grieve and look for other opportunities that will help you to feel better.